Last Saturday, Sacramento Mercy residents got the opportunity to take part in a special birthday celebration with a group of their favorite volunteers from Destiny Church. Destiny Church is a long-time Mercy supporter and also where the Sacramento residents attend Sunday morning services. No birthday celebration is complete without treats! For the past six years, Destiny Active Adults have been celebrating the birthdays of our residents with visits to the Sacramento home every two months. The tradition started out simply enough, with a birthday cake delivery, but over the years has evolved into a full-blown celebration including games, prizes, presents, treats and a devotional. On Saturday, volunteers Nancy, Karen, Jane, and Beth arrived early to the home to set up for the festivities. They served the residents sweet treats, soda, and fruit. As the birthday celebrations cover two months of birthdays at a time, this particular party was dedicated to Brittany and Paisley. Everyone sang “Happy Birthday” to the two birthday girls and then enjoyed socializing with one another. 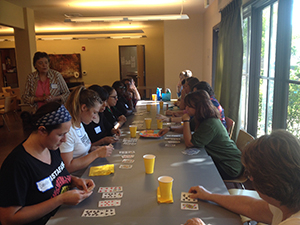 The volunteers led the residents in a game of bingo with playing cards. The winners of bingo, as well as the birthday girls, received a gift card donated by Destiny Active Adults. Mercy’s relationship with this Destiny group goes much deeper than birthday celebrations, as they continually show the love of Christ to our residents. One of the volunteers, Jane, shared a special devotional about humility. She read from Proverbs, Romans and Philippians and shared that being humble brings peace, joy, contentment, exaltation, and life. She encouraged the residents that giving up the right to be right brings freedom. The volunteers then spent time praying for the residents. Each winner of Playing Card Bingo won a gift card donated by the Active Adult Ministry at Destiny Church. The entire day left the birthday girls, Brittany and Paisley, feeling important, loved and cared for. The residents who are celebrated are not the only ones affected by the visits the Active Adults pay to our home. Volunteers Karen and Nancy said that it is a huge blessing for them to be able to give back. They always leave with such joy and happiness in their hearts. 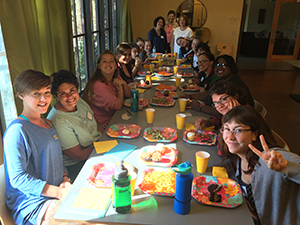 We are so grateful for their partnership and willingness to step out and come alongside our residents. Visit our website to learn more about volunteering in our homes.